For style and stability discover Custom Craftworks' Elegance Electric Massage Table from Massage Tools. The strong motor can lift up to 550 pounds. It works so quietly that you have to watch to see if the table top is moving. The table can adjust up to a height of 34 inches. However, its 18 inch height is a major plus for practitioners that are smaller in stature. Clients will love the feel of the soft upholstery that allows for immediate relaxation. The Elegance Electric comes with a built-in head rest. Its purchase also qualifies for a 50 percent tax credit. I have had this table for 7 years. It is an exceptional table, easy to use and very reliable. Excellent quality and function. Ii am a small short person and this table is the ONLY electric table that drops low enough for me to use comfortably. Truly a blessing!! I received my massage table yesterday. Delivery went smoothly and getting it in the studio did as well, need two strong people but was easy with a dolly . All you have to do is take some wrapping off, plug in and you are set to go! The reason I didn't give it 5 stars and thought about giving 3 is because the face cradle that came with it is beyond terrible. Yes, you can upgrade to get a better one but the default one shouldn't even be a option, it is awful. Purchased the replacement within minutes of setting up the table it is that bad. Not impressed with the tilt back feature either, it isn't worth the upgrade cost. The back consists of the waist up for the purposes of my wanting the tilt back but it seems to be a tilt for the shoulders and up, very odd feeling. 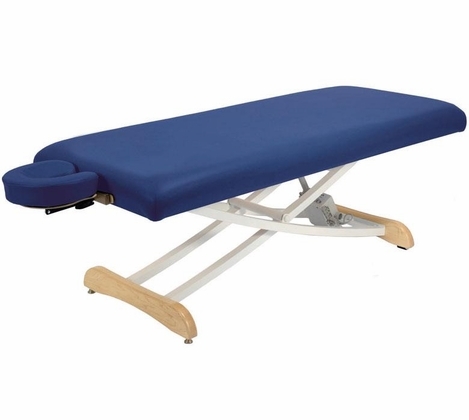 But if you purchase it just the basic set up with a better facecradle you will be using a very classy looking table that will make your life easier with different sized client.